Microsoft Office uses the language of the system to display interface elements usually. That's usually what users of the program want, but some users may want it to use a different language instead. I for instance prefer to run the English version of Microsoft Office. The reason is simple: whenever I write an article about Office, I need to use the English terms for menus and options as I write these articles in English. It would not do anyone good if I would reference these in German, as users would not be able to locate those in the interface. Changing the language may also be useful if you write in different languages regularly. The user interface includes all menus, buttons, preferences, and basically any text that is displayed as part of the interface. Proofing tools are used to check the grammar and spelling of text. The editing language in which content is edited. 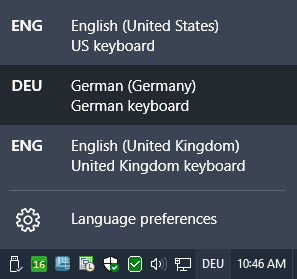 It is a good idea to check the available options in Office directly first before you start installing new language packs for the application. You do that with a click on File > Options, and the selection of Language from the sidebar menu. Note that what you change here applies to all Office applications, not just the one you opened the language preferences in. There are two main language configuration options on that page. You can change the editing languages (which include proofing), or change the display language. It is rather easy to add another editing language to Office. All it takes is to pick one of the available languages from the "add additional editing language" menu, and click on the add button to add it. 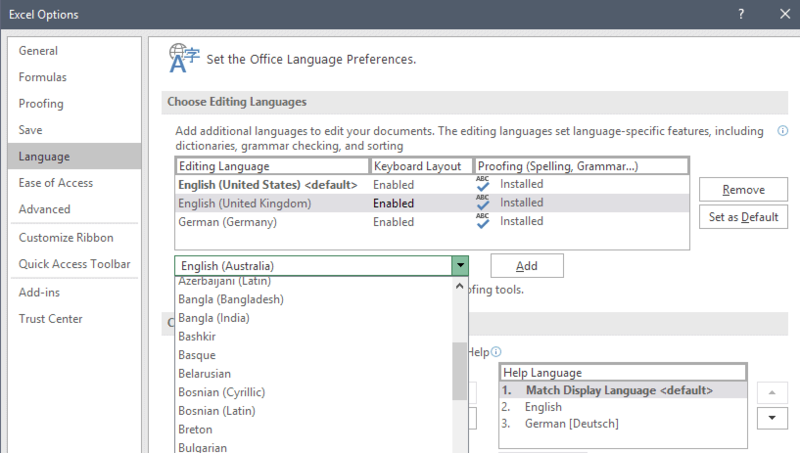 If I wanted to add Australian English to Office, I'd simply pick the language from the menu and click on the add button to do so. You can remove editing languages by selecting them and hitting the remove button, and set one language as the default. Changing the display language is not as straightforward as changing editing languages in Office. Microsoft recommends that you change the system language to the desired language if you want to change Office's interface language permanently. Select Start > Settings > Time & Language > Region & Language. Select the language from list of supported languages. Windows 10 starts the download right away. You can switch between languages with a click on the language abbreviation in the System Tray area of the system. Select Time and Language > Region and Language. Pick the language from the list to add it to the system. You may get a "language pack available" notification. Click on options if that is the case, and then on download. Select Start > Control Panel > Clock, Language and Region > Region and Language. Click on install/uninstall languages, and follow the instructions to install a language. With that out of the way, head over to the Language Accessory Pack for Office page on the Office website. 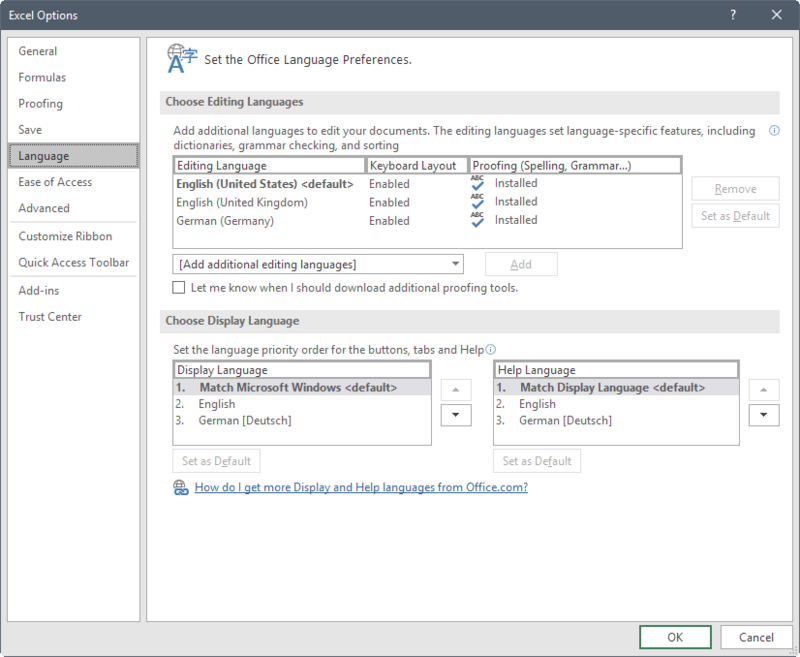 Select your Office version (2016, 2013 and 2010 are available), and then the language that you want to add to Office. This comes in form of a executable file that you need to run after the download completes. It installs the language, so that you may select it in the language preferences and make it the default language of Office. The guide walks you through the steps of changing the editing languages and the display language of the Microsoft Office application.